This CPR online course reviews the steps necessary for helping someone experiencing a sudden cardiac arrest (SCA). Participants review how to assess the need for CPR and how to perform life-saving cardiopulmonary resuscitation compressions and ventilations. Download the course, take the online quiz, and receive a certificate of completion. This was a great way to re-familiarize myself with CPR training. Awesome! Definitely recommend it, and I have been doing CPR training for over 30 years! Always changing and improving. Great review on CPR material. Concise and Clear. Great pictures for clarity. 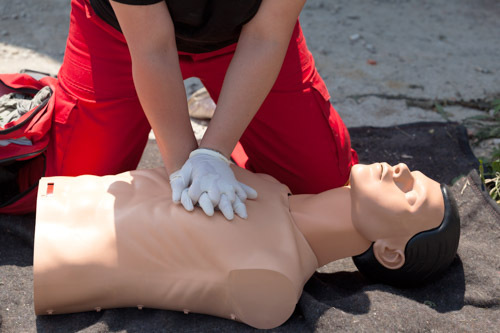 This CPR course is a great review of the other CPR courses I had taken. Great review, good to refresh the current ratios to compressions and ventilations. Good refresher and way to complete CPR requirement for NCCAOM recert. Short, clear and basic. Very good. This is a great way to refresh you knowledge of CPR and AED procedures. The information is accurate and to the point. All the information you need to review CPR in a concise and efficient course. The course material is organized in a way that is easy to follow and remember. Great course, simple, very easy to follow. This course is an excellent review of CPR and I recommend it to others. very good to test your knowledge. Excellent, detailed information, to the point. This course was a very effective and efficient course to use! I learned everything I needed to know in a very organized and clear-cut manner. Easy online course- would highly recommend doing an in person course every couple times as well just to get the hands on experience. This course is a really important review of life saving CPR Techniques. Very helpful, easy to complete. Detailed, clear and easy to understand with pictures. Very good. Would like to further my studies in CPR and first aid. This was a quick and easy review of the material. This was very clear and thorough. I am glad to be reminded of the protocols for CPR. Covered the material in a clear and concise manner. Easy to comprehend. Clear and concise. Great review. Glad to see this type of course is online. Great course! Simple easy to understand! Great - fast and very clear! Very clear. Easy to complete. Good refresher particularly if you've done an training in person with a doll beforehand. Very good written material and test effectively evaluated knowledge. Great information, easy to learn and apply. Thank you. It's convenient how accessible this course is! Information is thorough as well. Good, concise, easy to follow. I appreciate the convenience of being able to take CPR online. This course was a good review of CPR for adults, children and infants. Clear, thorough and expedient way to refresh yourself if you've already taken one or more recent hands-on courses. this is a good lecture to know core competency of CPR. Good course, Very clear, covers everything that is covered in an onsite course. Very well done. Great review! Good, clear, valuable information effectively and efficiently presented. I liked it; a good review. Great, all important info highlighted effectively. Great, quick overview. So happy to have this option available! The written materials are a good review. The test is appropriate. Very precise, to the point. Great refresher on CPR and AED use. Simple and easy to sign up and take the course and test. Informative, helpful and easy to understand course. So grateful this is available to us. Finding a course can be difficult, - this is wonderful and in depth. Everything a hands on class would give you - knowledge-wise. Thorough and easy to follow. A great refresher! Very concise and easy to follow. A nice refresher. Good easy to understand information and clearly laid out. Very informative and I would keep the notes with me to refer to. I was very happy with this course. The information was very clear and concise. This was a nice review course, especially following live CPR training several years earlier. It is a thorough overview, it was very helpful. It is thorough and easy to learn all the practical info and techniques of CPR. Great course. Well presented. Fulfilled my needs. Excellent refresher after having taken CPR classes for years in person. Easy to follow and super informative. This CPR class is straight and to the point, a good review. A concise and thorough class for CPR recertification. This course was very thorough and efficient. Great reminders and focuses on the key aspects of the process in a very clear organized way. This was a terrific way to review CPR certifications. The notes and pictures were extremely informative and very thorough. Excellent way to repeat your knowledge. Good review with helpful photos. This was a really great course and I am so happy we can take CPR this way. I can actually keep in my office and car a copy of this so I know what to do for instructions on the scene when there is so much confusion. Easy to understand, making for a good study format. Great reminder course! Thank you so much! It was very clear and easy to follow!